Turner produced this radiant evocation of a summer’s morning in the Wiltshire countryside for his set of Picturesque Views in England and Wales (1825-38). This extensive and consistently rewarding sequence has long been celebrated as the finest of Turner’s topographical projects, featuring images in which he consolidated his considerable technical accomplishments in watercolour. Most strikingly, the England and Wales series embraced a very diverse range of subjects, from very contemporary depictions of the new industrial Britain, to more nostalgic subjects, recorded many years earlier. The view of Malmesbury falls into this latter category, taking its place as a restatement of a setting Turner had known since his adolescence, here enriched with over thirty years of experience. He had first visited Malmesbury Abbey in 1791, aged only sixteen, on his earliest significant tour outside London. Travelling between London and Bristol, as Turner was, the quiet market town of Malmesbury was only a short detour from the main road, about ten miles north of Chippenham, and evidently offered a welcome rural contrast to the more familiar metropolitan bustle of the trading port on the River Avon and nearby Bath. Although his earliest professional efforts had already demonstrated his skills as an architectural draughtsman, the abbey appears to have been the first substantial religious ruin Turner had encountered, and so presented a stimulating new picturesque challenge. Recent archaeological excavations at Malmesbury have discovered there was a settlement as early as the Iron Age, and that the Romans also exploited the commanding hilltop, with its freshwater springs. But the origins of the present village stem from the seventh century, when an Irish monk founded a mission there. The emphasis on teaching in that initial endeavour was consolidated by the establishment of a Benedictine abbey around 675AD, and by the eleventh century the institution was considered one of the foremost centres of learning in Europe, possessing an unparalleled library. As the abbey gained in wealth and reputation, the town also expanded, appearing as a place of substance in the Domesday Book, with the distinction of being one of the oldest English boroughs (or ‘burhs’), a charter previously conferred on it by Alfred the Great. The late Romanesque abbey church, originally dedicated to St Mary and St Aldhelm, was under construction by the mid-twelfth century, with further expansion two centuries later, and eventually consisted of twin towers at the west end, a nave of nine bays, a spire over the crossing, and a further six bays to the east for the chancel. On the south side a richly carved porch was added, boldly ornamented with figures and intricate patterns. However, the steady accumulation of architectural glories at the abbey came to an end in the sixteenth century. Serious damage to the heart of the building occurred around 1500, resulting from the collapse of the great spire, a lead-covered, wooden structure of 431ft (nearly 30ft higher than that at Salisbury). Its destruction effectively divided the nave from the presbytery. But before any plans for reconstruction could be advanced, in December 1539 the abbey was appropriated by Henry VIII’s commissioners, under the ruling that dissolved monasteries across the country, and sold to one of their number, a local wool trader called William Stumpe. He subsequently presented the core of the building – essentially the nave – to the town as its parish church (thereafter dedicated to St Peter and St Paul), but retained the rest of the land for his own interests. Stone from the ruined east end of the building was inevitably repurposed elsewhere, very probably for the town’s market cross. Further damage to the church was sustained during the Civil Wars, when the west towers were commandeered as a gun emplacement, making them a target for the attacking troops. Finally, the form of the building that Turner would later see was also shaped by the fall in 1660 of the south-east column that had previously supported the spire. 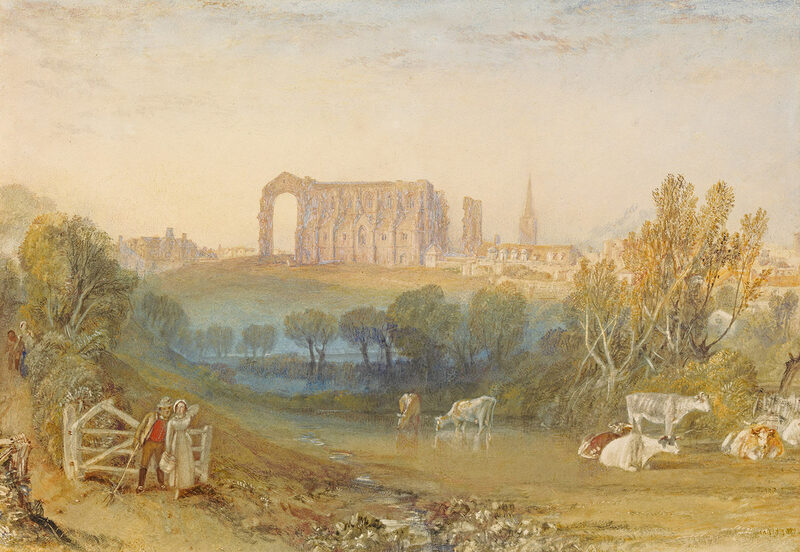 Exploring this battered and ravaged edifice, and contemplating its part in the nation’s history, was clearly a significant experience that resonated down the years as profoundly with Turner as Tintern Abbey for Wordsworth. Nevertheless, even before he began to explore Britain’s ruined castles and abbeys for himself at the start of the 1790s, the young Turner had become familiar with the appearance of many of them through his work in hand-colouring the printed illustrations in a copy of Henry Boswell’s Historical Descriptions of New and Elegant Picturesque Views of the Antiquities of England and Wales &C. This often-overlooked part of his earliest apprenticeship, which also permitted him to read the commentaries accompanying each image, crucially equipped him with a sense of the antiquarian’s priorities in surveying these remnants of the past. By the time of his first visit, Malmesbury had been frequently depicted by topographical artists, several of whom were rather more distinguished than those who had contributed to Boswell’s Historical Descriptions. For example, over sixty years earlier Samuel and Nathaniel Buck (whose survey of Britain remains a standard reference point in the representation of British monuments) depicted the southern side of the abbey, thereby establishing a viewpoint that had become the norm for other artists by the early nineteenth century. Their observation of the architecture is invaluable for its straightforward, pre-photographic record of the abbey’s dilapidated state, prior to its subsequent restoration. More imaginative, however, and more influential on the fledgling Turner were the prints based on Thomas Hearne’s pictures of the abbey, engraved by Samuel Middiman and William Byrne, and published in 1780 as part of the publication The Antiquities of Great Britain. One of these relatively recent images was an upright composition that deployed the blasted fragments of the towers beside the west front to frame the central space, simultaneously highlighting how the abbey’s ruins were by then turned over to agricultural uses. Turner followed this model closely, right down to the pigs snuffling in the foreground, but he selected a slightly different position in some of the sketches he made during his visit in 1791, which he later developed for the watercolour he exhibited at the Royal Academy in 1792 (fig.1). Turner’s 1791 sketches also reveal him studying the incongruous juxtaposition of haystacks alongside the abbey’s great walls and arches at its south-eastern corner, a prospect that seems not to have been selected by other artists until John Britton adopted it later. Despite the novelty of that subject, it is clear even at this stage that the angle of the abbey Turner preferred was actually that from the north, and slightly to the west, which best displayed the remaining, gravity-defying arch that had earlier supported the spire, as well as the shattered fragments of the west front and its towers (fig.2). In his sketches Turner liked to use the craggy towers to frame the fourteenth-century spire of the church of St Paul, the original parish church, which was probably in use as a poorhouse by that date. Once again, his preference for a view of the abbey from the north suggests an awareness of Hearne’s earlier treatment of this prospect, in which the wide expanse of the inundated water meadows below the abbey served to accentuate the silhouette of the ruins on the hillside above (fig.3). This was evidently a useful prototype, as the present watercolour testifies. But having discovered the strengths of this viewpoint, Turner initially sought more conventional ways of structuring his picture space, leading the viewer’s eye into the distance after passing under trees and past the mill on the banks of the Tetbury branch of the River Avon. On revisiting Malmesbury during the following years, most probably in either 1793 or 1795, Turner made further sketches of the abbey from both the south-east and the north-west. As the dimensions of the paper used for those works are directly comparable to those in the ‘South Wales’ sketchbook (TB XXVI; Tate), it seems likely that both sheets were formerly part of it, although they have sometimes been dated to earlier years. This may well also be the case for two further views of Malmesbury, both of which depict the abbey much as it is seen in the England and Wales watercolour, from directly to the north. The first, an incompletely coloured pencil sketch, is at the Whitworth Art Gallery in Manchester; while the second, now at The Clark in Williamstown, is a fully realised watercolour of a similar date, developing the same composition (figs.4 and 5). This finished work is comparable stylistically and in colouring to the commissioned watercolours of Hampton Court in Herefordshire that Turner produced for Viscount Malden in 1795. By that year Turner was already painting designs that were being reproduced as line engravings for the Copper-Plate Magazine or the Lady’s Pocket Magazine, so it has reasonably been suggested by Andrew Wilton that the view of Malmesbury was developed for a similar purpose. However, it was not until 1 May 1809 that the view of Malmesbury was published as a hand-coloured aquatint by Reeve and Jones. Although this engraved view can be seen as the essential template for the much later England and Wales watercolour, Turner revisited Malmesbury yet again in 1798, which provided a further opportunity to study the architecture and to enjoy the surrounding countryside. During the visit he used twelve pages of the ‘Hereford Court’ sketchbook for crisp transcriptions of the abbey, both in close-up and from a variety of compass points in the countryside (TB XXXVIII; Tate). In addition to those, he covered perhaps six page openings in the smaller ‘Dynevor Castle’ sketchbook, with other views and supplementary architectural information (TB XL; Tate). The extent of this renewed survey clearly implies a serious purpose. Turner himself later insisted that this journey to Malmesbury had been occasioned by a commission from Sir Richard Colt Hoare for a group of views. However, that assertion is only documented more than seven years after the trip by the rather substantial bill of five guineas that Turner submitted for his travel expenses. Intriguingly, this invoice proved contentious with Colt Hoare, who declined to pay, refusing to be ‘overcharged’. This is all the more curious in that five of the sheets in the ‘Hereford Court’ sketchbook are annotated in pencil with Colt Hoare’s name, following the practice Turner used to identify subjects that had attracted specific commissions, and thereby indicating an agreement at some stage about developing these compositions. But because there is no way of establishing exactly when the inscriptions were made, they could date from either soon after the 1798 visit, or much later. For example, an alternative date could be around 1805, when Colt Hoare, as newly-appointed High Sherriff for Wiltshire, might feasibly have requested additional views of his home county to complement those of Salisbury that Turner was slowly completing for him (a series begun nearly ten years earlier). This conclusion might explain why he objected so strongly to the attempt to get him to pay Turner’s travel expenses. Indeed, had he only recently approved a selection of existing, earlier views in the sketchbook, he would have known very well that he should not be held responsible for the costs of getting Turner to Malmesbury. Sadly the difference of opinion between artist and patron seems to have prevented any advance on the project, with the result that ultimately none of the selected sketches was fleshed out in watercolour. Significantly, for present purposes, two of the sketches depicted the abbey from the north (one of which was among those annotated by Colt Hoare), once again reiterating the appeal of this viewpoint. The foregoing summary of these three formative visits to Malmesbury should by now have indicated Turner’s pragmatic use of his primary material as a commercial artist, but also something of the way his finished watercolours are often built up though an accumulation of overlapping experiences and infused with his deeper meditations on the subject. It was inevitable, therefore, given his familiarity with Malmesbury, that he chose to develop a view of the abbey among the earliest batches of watercolours when he embarked on the England and Wales project in the mid-1820s. Shortly before this he had tidied up and labelled the ranks of sketchbooks he had amassed over the years, and this would have undoubtedly facilitated ready access to his various outlines of the abbey. But in any case, the image of the ruins straddling the hilltop was firmly ingrained in his mind’s eye. Of the sketches he could have drawn on, the closest to the resulting composition is the one from the 1798 ‘Hereford Court’ sketchbook (fig.6), which bears splashes of colour testifying to its usefulness. He evidently modified some of the details, either through recollection or reference to related sketches, and in the process refined and lightened the upper part of the great arch so that it soars gracefully over the empty space below it, which he cleared of any other buildings. More generally, the overall width of the landscape is also a notable feature, especially when compared to how others have represented the scene. For example, in Peter De Wint’s watercolour the abbey is less monumental and more contained (fig.7). No intermediary colour studies have been identified, as is often the case for Turner’s England and Wales works, which suggests he resolved the finished watercolour much more effortlessly. Whereas one of the 1791 views of the abbey from the north shows the stone lit from the right by the setting sun (see fig.2), Turner decided here to evoke the stillness of dawn, soon after sunrise. In the sky, the effect is graduated very delicately, rising from the yellow glow silhouetting the abbey to the touches of crimson on the high clouds. In the foreground the cows cast long low shadows, and beyond the pollarded trees an evanescent pearly morning mist is dispersing. The nuances of colour suggested to one scholar that Turner’s realisation of shadows was more analytical than the French painter Claude Monet was prepared to admit, and that the effect here actually anticipates this aspect of Impressionism. A more earthy and humorous touch is provided by the figures at the gate: a milkmaid with her attendant, rather gruff-looking admirer, whose wooing provides amusement for two children lurking further up the track. Perhaps coincidentally the path just here in Malmesbury is now known as ‘Lover’s Lane’. We can also speculate whether this incident is in some way a sublimation of Turner’s frustration in not being able to develop the set of views of Malmesbury for Colt Hoare. As recently as 1825 Turner had depicted Colt Hoare’s famous landscaped park at Stourhead, and he evidently retained a connection with his former benefactor. And though no further commissions or picture sales were forthcoming, Colt Hoare continued to take great pride in having been among Turner’s first significant patrons. He was a noted classicist and would have been as ready as Turner to find parallels between the antics of contemporary farmhands and shepherdesses and those described in ancient literature. So by introducing the figures in Malmesbury Abbey Turner could well be evoking and updating one of the classical narratives in which the unwelcome attentions of an ardent suitor are mocked and ultimately thwarted. In 1829, around the time that the engraving based on the composition was completed, the watercolour itself was exhibited at the Egyptian Hall in Piccadilly in a show designed by the publisher Charles Heath to promote sales of the England and Wales prints. One contemporary journal described the impact of the forty or so works on display: ‘The drawings are splendid specimens of taste and execution, and collected and hung together as they are here, produce an effect beyond expectation, brilliant and beautiful’. John Charles Varrall, who produced the skilful translation of Turner’s design, was a relatively new addition to the team of engravers who overcame the problems posed by the need to find approximations of colour in black and white (fig.8). Following the 1829 exhibition, the watercolour has had a distinguished and fully documented history, and has taken its place in some of the most important collections of Turner watercolours, both during his lifetime and afterwards. In the later nineteenth century, for example, it was owned by John Grant Morris, a colliery proprietor based in the north-west, whose activities as an art collector led some to describe him as a Liverpool ‘Maecenas’. As well as Malmesbury Abbey, he acquired Turner’s Lulworth Castle, Dorsetshire, from the series of Picturesque Views on the Southern Coast of England (now at the Yale Centre for British Art, New Haven). Within a few years of his death the watercolour had passed to the talented amateur musician, Marguerite Agaranthe Miles (1868-1943), who is better known as Lady Tennant. Her name is now immortalised to describe the record-breaking Stradivarius violin presented to her by her husband, the Scottish businessman, Sir Charles Clow Tennant (1823-1906). See Eric Shanes, Young Mr Turner. The First Forty Years, 1775-1815, New Haven and London 2016, pp.6-7 and p.468, n.29. See Hearne’s pl.XXVIII for The Antiquities of Great Britain. For Turner’s 1791 sketches, see TB VII C and D (Tate: D00110, D00111). The second of these experiments with a higher viewpoint, but like its companion looks down through the ruins of the south-west corner of the church. Hearne’s published view looks into the same corner, but from the north-west. Turner’s exhibited watercolour is now at Norwich Castle Museum; see Wilton 1979, no.25, and Shanes 2016, p.46, fig.55. A second version of this work, dated 1794, is in a private collection (Wilton 1979, no.64; Shanes 2016, p.93, fig.111). Bristol and Malmesbury sketchbook (Tate) TB VI 12-13 (D00086-D00087). The composition was reworked on a separate sheet: TB VII E (D00112). TB VI 10, 21, and Wilton 1979, no.24 (private collection; see Shanes 2016, p.44, fig.53). The latter watercolour may have formerly been a part of the Bristol and Malmesbury sketchbook. It probably belonged to Dr Thomas Monro and can perhaps be identified as one of the two items included in lot 66 on the fourth day of the Christie’s sale of deceased doctor’s collection, on 1 July 1833, described as a ‘View of Malmesbury Abbey, and a water-mill’. The small watercolour at Bury Art Gallery (Wilton 1979, no.26) is a more confident rendering than Turner’s earlier sketches (listed under fn.3, above). Similarly, the pencil sketch now at Indianapolis Museum of Art, although sometimes dated to 1791, possesses the same intricacy and delicacy as the architectural sketches made in 1795 (see Martin F Krause, Turner in Indianapolis, 1997, pp.25-7). These works are respectively discussed in the following volumes: Craig Hartley, Turner Watercolours in the Whitworth Art Gallery, 1984, pp.10-11; Andrew Wilton, Turner, Girtin and Bonington. A New York Private Collection. Paintings, Watercolours and Drawings, 2001, pp.26-28. Since the publication of the latter the watercolour has become part of the collections at the Sterling and Francine Clark Art Institute at Williamstown, Massachusetts (see Jay A. Clarke, Landscape Innovation and Nostalgia. The Manton Collection of British Art, 2012, p.282, no.209 as ‘Malmesbury Abbey from the South, c.1794’). See the impression formerly owned by William Ward in the British Museum (1893,0612.189), in which the spire of St Paul’s church is moved to the right, into the gap between the ruined towers of the west front. A companion view of Peterborough Cathedral, based on another early watercolour, was published at the same time (1893,0612.184). Other impressions of both subjects can be found in the Yale Center for British Art at New Haven. The book has been rebound in the sequence that follows, which is not necessarily the order in which the images were recorded. The numbers given here are those actually stamped on the pages, as described in A.J. Finberg’s 1909 Inventory of the Turner Bequest: 3 (West Front ruins; D01252); 4 (Interior of the Abbey; D01253); 1 (Abbey from the north-west; D01250); 2 (Mill on the Tetbury branch of the Avon, with the Abbey above; D01251); 74 (West front and Spire of St Paul’s Church; D01328); 86 (Abbey from the north; D01340); 5 (The Bridge over the Avon, with Abbey beyond; D01254); 6 (Market Cross; D01255); 7 (Abbey from the south; D01256); 8 (St Paul’s spire and Abbey ruins from the west; D01257); 9 (South Porch; D01258); 10 (Abbey from the other side of the Avon to the south-west; D01259). Those marked with Colt Hoare’s name are pages 4, 6, 9, 74, 86. It may be purely coincidental that the Reeve and Jones aquatint already mentioned was published just a couple of years after this incident. The catalogue for the 1899 exhibition at the Guildhall described the time depicted as ‘late afternoon’, but most recent commentators identify it as a morning subject. The Athenaeum, 10th June 1829.